Unfortunately not everyone is born with perfectly straight teeth, orthodontic treatment is a way of straightening or moving teeth to improve how they work and therefore their long term health or just to improve their appearance. For the best results treatment is usually carried out in children, but adults can have orthodontic treatment too. For children It may be necessary to wait for enough teeth to come through before starting treatment. Dentists are qualified to carry out orthodontic treatment. Other specialists in this area (Orthodontists) can also provide treatment and they may be in a practice or in a hospital department. Both will conduct a full examination first where they will look at your teeth, take x-rays and likely make plaster models of your teeth so they can advise on what treatment is possible. A plate that can be taken out to be cleaned. They move the teeth using gentle pressure delivered through the wires and springs attached. These appliances use the power of your jaw muscles and can help with certain types of problem and possibly change the way the jaw grows. Fixed appliances are used to guide teeth more accurately it is called fixed as it is not possible for the patient to remove. These have brackets and bands temporarily stuck to the teeth with a flexible wire joining all the brackets to allow the teeth to be moved. It is sometimes necessary to wear headgear as well as an appliance. This will only be required in the evening or at night. These refer to delicate elastic bands that are applied to a fixed brace to help move the teeth. Clear plastic ‘aligners’ that are used to straighten teeth. Worn for nearly 24 hours a day but they can be removed for eating, drinking, cleaning. A course of aligners will involve using a specially moulded set of moulds that vary slightly. Each set is worn for two weeks and then replaced by the next one. As they are nearly invisible this is a very discreet way of straightening teeth.. The treatment time is dependent on the severity of the problem. Treatment could take between a few months or up to two and a half years. Orthodontic appliances usually need adjusting every 4 to 6 weeks but this will be advised by your dentist or orthodontist. 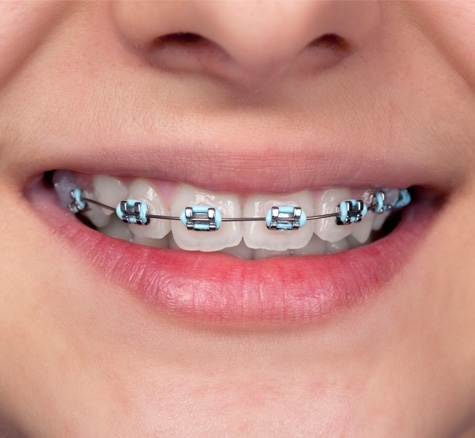 Will having orthodontic treatment hurt? All appliances will take a while to get used to and may cause discomfort initially. Your orthodontist may be able to adjust them to make them more comfortable. Appliances will not in themselves cause damage, but poor cleaning and too many sugary foods and drinks can. Wires, brackets and braces can trap food and cause a greater than usual plaque build up so it is important that the appliance and teeth are thoroughly cleaned. • Maintain regular visits to your dentist in addition to your orthodontic treatment. • Brush your teeth carefully twice a day, the use of a mouthwash may also assist in keeping your teeth and gums clean when wearing an appliance. • Clean between teeth where you can, there are a number of interdental brushes and floss harps that may make this easier than using traditional floss. • Clean appliances carefully to avoid damaging them as they are often delicate. • Your dentist/hygienist/orthodontist will advise on the correct cleaning techniques appropriate to your appliance. • Cut down on sugary foods and drinks and particularly avoid sticky and hard foods that could damage the delicate appliances. • Brush your teeth twice a day with fluoride toothpaste and, if necessary, use a mouthwash. • Your dentist or hygienist may recommend a fluoride toothpaste or application for you to use.